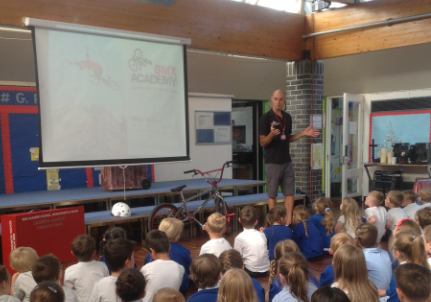 We are lucky to have Mike Mullen from http://www.bmxacademy.com/ visiting the school today. 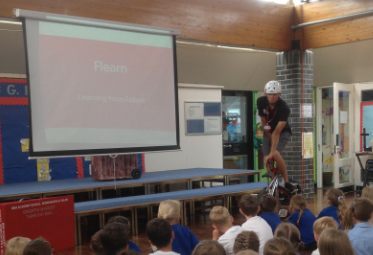 He talked to the school about the importance of having a growth mindset as well as "flearning". A lot of his principles and messages fit in with our 5 # values of #growth, #respect, #enjoy, #achieve, #team. 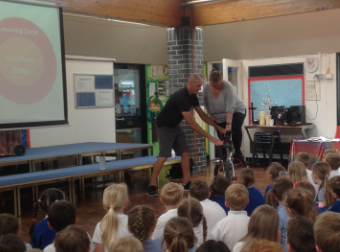 Mike told the children about when he was at school: he was often shy and could sometimes have excuses about why he couldn't do things, until one day he got his first BMX, found a role-model and realised that in order to succeed at something you love, and be the "greatest" you can, it takes hard-work and an 'I can' attitude. He explained the importance of learning from your failures, picking yourself up and trying again! He then asked for an adult volunteer to try out a trick and Mrs Boldero was brave enough to do so (showing an 'I can' attitude, rather than avoiding eye-contact and making excuses!). Well done Mrs Boldero, you really deserved the cheers and round of applause at the end! 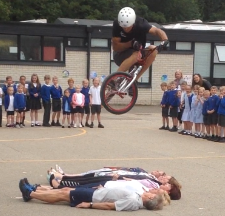 We then moved out to the playground and were astounded by some of the tricks we saw Mike perform! Mrs Boldero got to choose 6 'victims' for Mike to jump over in his finale! The children were enthused and engaged throughout. Later in the morning and the afternoon, Mike ran workshops for Hare and Osprey classes where they had the opportunity to push themselves and try out something many of them have not had the opportunity of doing themselves. What a fun day, full of challenge and Flearning!